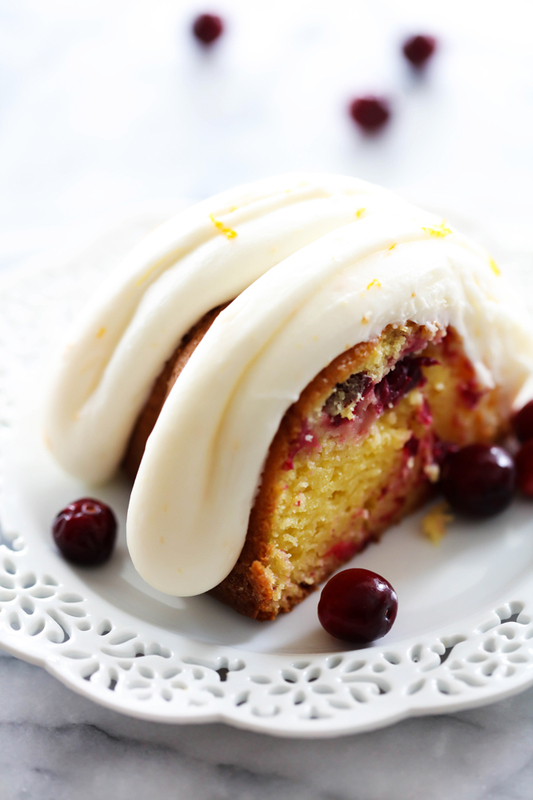 This Cranberry Orange Bundt Cake is the perfect holiday treat! This cake is so moist and the flavor is spectacular. This is sure to be a show stopper at your holiday gatherings! Funny story. I actually made and photographed this cake LAST year, but due to a large amount of recipes scheduled during the holidays last year, I never had the chance to get this recipe up before cranberry season was over. I am so excited to be able to share it with you this year, because trust me, this is going to become a new holiday staple in your home. Bundt cakes are a favorite of mine. 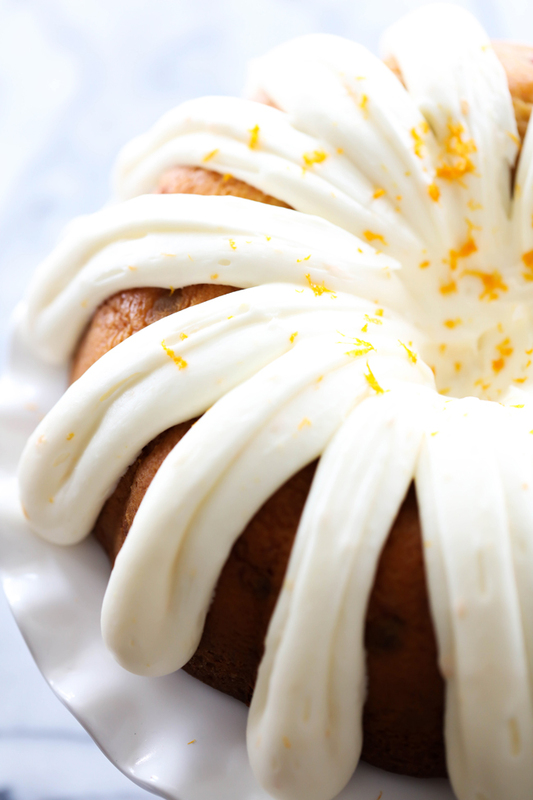 The bundt cake recipes found on my blog are moist and ready to dazzle all who try them. 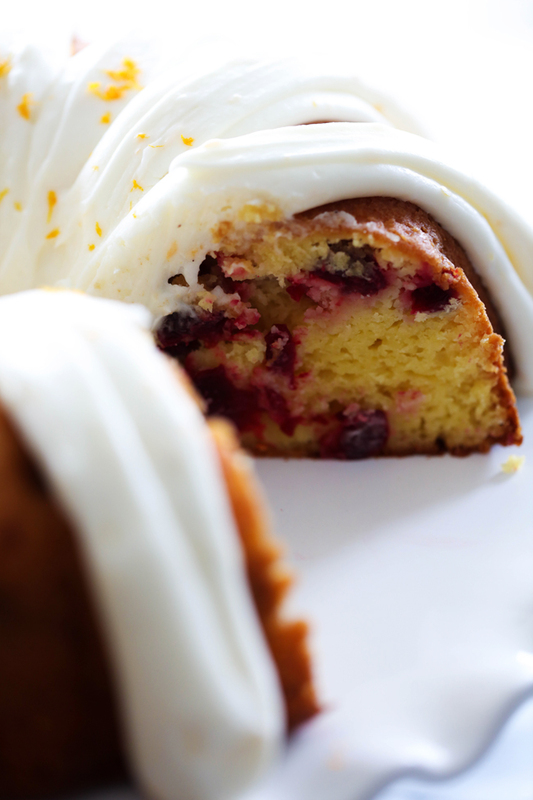 This Cranberry Orange Bundt Cake is no exception to that statement. This cake is sweet and tart. The flavors of the cranberry and orange fuse together wonderfully. This is truly a delightful dessert you will want to make over and over again! Don’t let the season pass you by without baking this cake! It will be the star dessert wherever it goes! In a large bowl, mix all cake ingredients together except for the cranberrie and beat for 3 minutes on high. Stir in cranberries and pour into a greased and floured bundt pan. Bake 40 to 50 minutes or until a toothpick comes out clean. Let sit in pan for 5 minutes, then invert onto a cooling rack. In a medium bowl combine cream cheese, powdered sugar, and zest, and beat on high until creamy. Do the cranberries really cook in the cake? You are talking about the kind of fresh cranberries you can buy in a bag at most grocery stores, right? Even the cranberries decorating your plate in the photograph don’t look “raw”. The cranberries decorating the plate certainly look raw to me! And yes, she means the fresh cranberries you buy in the produce department at the grocery store. No need to worry, Ed......go ahead and try making it! is the vanilla pudding instant or the kind you cook? Love the tip to wrap cake in plastic wrap. Will cranberries cook in the cake. I want to make this cake. Love moist bundts for the most wonderful time of year ! Thank you so much ! look at your cake picture again because mine didn't rise very much and thought I did something wrong but your picture shows exactly what mine looked like. Will definitely make again. It really smelled wonderful when it was baking though. I saw other recipes for cakes like this and they say to whip the eggs and sugar first for 5 - 7 minutes because it acts as a leavening agent.